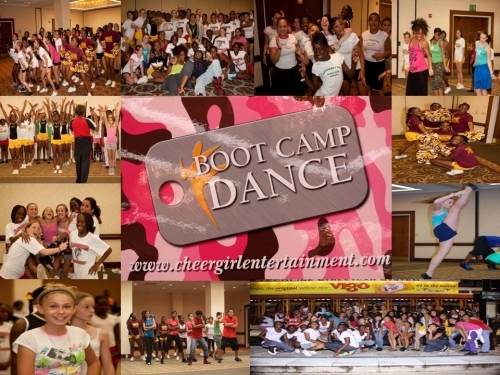 Cheer Girl Entertainment Presents...BOOT CAMP DANCE! 10 Choreographers! 20 Routines! Hey guys Jerm here with an update about a must attend Tampa Bay event happening this weekend in downtown Tampa at the Hyatt Regency hotel! Cheer Girl Entertainment presents a one day Dance and Cheer-leading event! 10 professional choreographers, 20 amazing fully choreographed routines! For those of you not familiar with entertainment, here is a brief bio taken from the website. "Cheer Girl Entertainment provides non "cookie cutter" routines to fit your specific needs. Each routine is tailored to YOUR specifications. If your squad&apos;s needs include a competition routine, no other team will be privy to your highly stylized routine. If you are a business needing professionally choreographed entertainment for a trade show or an annual/community event, we can assure you that a CGE production will compliment your event quite nicely! Celebrity functions are a staple for Cheer Girl." Teams and individuals welcome, ages 13 and up! A great reason to get out and shake your tail feather so be sure to checkout the website to get more info and register! Ticket Info: $55 per participants- 8 hour convention (includes lunch*) $65 after 9/18. That&apos;s all I got for now folks, but be sure to stay tuned in for more Tampa Bay entertainment related news from Jerm!